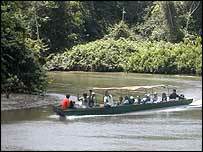 It is early morning in the jungle and a motorised wooden canoe glides slowly along the Capahuari river. Standing at the front is Ruben Shakay, a native Indian guide, sharing the secrets of his Amazon home with small party of tourists from around the world. He is using his keen eyesight and intimate knowledge of the rainforest to point out birds along the river bank: parrots and macaws, weaver birds, and the hoatzin - a leftover from pre-history that, like the pterodactyl, has claws on its wings. Mr Shakay is a member of the Achuar nation, an indigenous people who live in one of the remotest parts of Ecuador's Amazon basin. He works for the Kapawi Ecolodge. This safari-style collection of wooden chalets - accessible only by air - is in the heart of the tribal reserve. 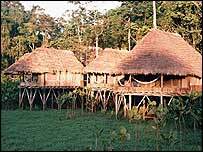 The Achuar granted the owners permission to build here in return for a substantial monthly rent and a commitment to train them to take over the running and management of the lodge by 2011. Though the tribe had almost no contact with the outside world a generation ago, today its members are keen to share their ancestral home with eco-tourists. Beneath the forest lie vast untapped reserves of oil and gas, and the hope is that the more the world knows about the pristine rainforest the more difficult it will be for the oil companies to come in to exploit the reserves. "The forest is like a supermarket for us," said Mr Shakay. "There is plenty to hunt and fish. It provides our food, our medicines and our tools. But if oil companies come here, they will build roads and bring diseases we have no immunity against. It would destroy the forest." Today more than half the staff at the lodge - cooks, cleaners, waiters, boatmen and guides - are Achuar. It has been a slow process. Many of the Achuar have to travel several days by foot to get to the lodge. They work for a month, then have several weeks off at home. So far only men are employed and their wives stay at home with the children. Yet many of the jobs, such as cooking and cleaning, are traditionally women's work. "The hardest part of the transition process is to change their way of thinking, their culture," says the Kapawi Lodge's Miguel Carrera. 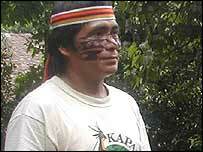 "The Achuar men never cook, never clean, never serve, but they must do all these things here. It took time but now we are about to select the best and send them away to learn English and management skills." But what impact is this having on the Achuar's traditional lifestyle and culture? It was Mr Shakay's time to go home to his family, and he invited us to accompany him to see how a traditional community live. Instead of the usual two-day walk, we go by motorised canoe. After a six-hour journey along the Bobonaza river we arrive in a part of the rainforest few foreigners have visited before. 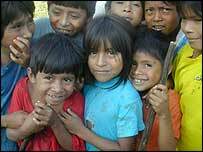 Chichirota is a hamlet with half a dozen longhouses, home to some 80 people, many of them children. What greeted us was a mix of old and new: hunters in jeans and T-shirts, with spears and blowpipes. Several sported brightly coloured headbands of toucan feathers and many had painted faces. There are two leaders in the community: the traditional shaman or spiritual head, and the more modern position of the Sindico. This person is elected, and is chosen to organise the communal work and hunting rotas; the first signs of democracy at a local level. The Sindico, Hilario Kuja, said he was pleased that two men from the village work at the hotel. "They pass on their new skills and the money allows access to medicines and education." One of the men, Felipe Wek, works as a handyman and gardener at the lodge. His wife was delighted at the help and new ideas he brought to her small plot on the edge of the hamlet. The community has a school built by missionaries. For the Achuar, education is seen as the key to controlling their destiny. The teacher completed his studies in the nearest town and, like many who have been away, he has returned to help the next generation prepare to deal with the outside world. Mr Shakay believes knowledge and tradition can go hand in hand. "In the future I want the children to have the same as me," he said. "I speak Achuar, Spanish and a little English. I also want to teach them what I know, how to live off the forest, build homes and hunt with blowpipes. They mustn't forget our language, our customs, our culture. Without these things we would no longer be Achuar." No-one yet knows whether today's children, armed with 21st-Century skills, will still want to preserve their traditional way of life.